The Arkansas Rock Art project started in 2000, when Michelle Berg Vogel, then of the Arkansas Archeological Survey's Coordinating Office, participated in a week-long rock art documentation program conducted at Petit Jean State Park. During the same year, George Sabo III of the Survey's Fayetteville research station applied for and received a grant from the Arkansas Humanities Council for a project titled "Drawing on the Past: Educational Resources for Studying Arkansas Rock Art." That support enabled us to assemble existing information on Arkansas rock art within a standardized database, develop protocols for recording new field information based on the Petit Jean workshop, and create an earlier version of this website. 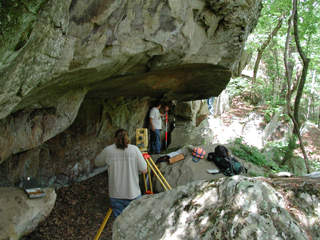 In 2003, Sabo received a three-year grant from the National Endowment for the Humanities to support a more extensive investigation of Arkansas rock art. That effort sought to examine rock art within the context of past cultural landscapes, and to investigate relationships between Arkansas rock art and the iconography of the Southeastern Ceremonial Complex, a set of religious beliefs and institutions widespread across the Southeast between A.D. 1000 and 1500. The Arkansas Rock Art Project is directed by Dr. George Sabo III and Jerry E. Hilliard of the Survey's Fayetteville research station. Past and present project crew members include Michelle Berg Vogel, Michael Evans, Aden Jenkins, Jared Pebworth, Larry Porter, and Leslie Walker. The Survey's Computer Services Program provides the talents of Dr. Jami J. Lockhart, John Samuelsen, and Deborah Weddle for GIS applications and database/website development. Survey Registrar Lela Donat provides guidance and assistance with records management, and Deborah Sabo of the Survey's Publication Program is project writer and editor. External project collaborators include geochemists Dr. Jon Russ (Rhodes College), Sarah Spades (Arkansas State University), and Dr. Karen Steelman (University of Central Arkansas). We are grateful for additional support provided by Ben Swadley of the Arkansas Department of Parks and Tourism, Janice Dent of IMPAC Technology Solutions, Dan Marzoni of the Fayetteville Public School System, Stacey Halfmoon of the Caddo Nation of Oklahoma, and Carrie Wilson of the Osage and Quapaw Tribes of Oklahoma. The Arkansas Rock Art project is part of the Arkansas Archeological Survey's continuing effort to study our state's irreplaceable cultural resources and to provide information and educational materials for a variety of audiences. Arkansas rock art is an important cultural resource about which little information is publicly available. The primary goals of this project are to create a systematically organized body of information on Arkansas rock art, to advance research on rock art that leads to a better understanding of its role in past cultures, and to develop resources and educational materials to serve the growing interests of archeologists, the educational community, and the general public. AAS staff at a rock art site. The project has three components. First, is gathering and organizing information on Arkansas rock art from archival sources and from new fieldwork studies. Much information is available in publications and in Survey research files, but very little of it is systematically organized and many of these sources are hard to find. Prior to this project there were no compilations of information to support the research needs of scholars or to serve as a basis for learning materials for students, educators, and the general public. As part of the information gathering process, we established procedures and an accompanying set of recording forms for documenting Arkansas rock art, based on methods developed at the 2000 documentation workshop held at Petit Jean State Park. The new recording forms can be used to transcribe information from archival and published sources as well as to record information during actual site visits. Second, we created a computerized database for Arkansas rock art that is now part of the Survey's AMASDA database system (Automated Archeological Site Data in Arkansas). The complete database is available to scholars through the Arkansas Archeological Survey Registrar's Office. An on-line version of the rock art database that does not reveal site locations is accessible from this website. Third, we are developing a variety of research and educational resources on Arkansas rock art for professional and public audiences. Our interests center on the study of rock art within three comparative frameworks: 1) artworks produced on other media, such as decorated ceramics and engraved shell; 2) the physical and cultural landscape contexts in which rock art occurs; and 3) Southeastern Indian religious beliefs and practices, especially in relation to the Southeastern Ceremonial Complex. Many resources developed in relation to these interests are available on this website. 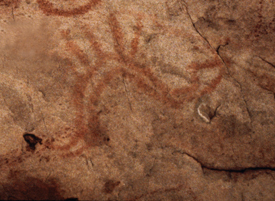 What can rock art tell us about the past that cannot be learned from other sources? Rock art is a direct manifestation of prehistoric thought systems. Like other art forms, its essential purpose was to represent and communicate the concepts through which prehistoric peoples defined and understood their worlds. For example, the locations and characteristics of many rock art sites suggest that they were used for vision quests, places where individuals underwent private rituals to establish a spiritual path for their lives. 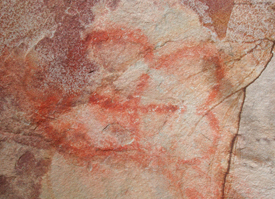 At those sites, rock art represents the imagery associated with personal religious experience. Other sites were places where communal activities were performed; there, rock art portrays cosmological themes associated with the spiritual life of the community. The human figures rendered at some rock art sites compose intriguing picture stories that tell about activities, statuses, gender associations, and other aspects of the human propensity to define our place in the world. In sum, rock art is a form of communication that, if correctly decoded, can reveal the varieties of prehistoric imagination. There are a few pseudo-scholars who promote rock art as the work of 'visiting aliens' or 'lost Egyptians' and there are others who insist that treasure maps or maps of vanished continents are depicted. We might ignore such fringe interpretations, or write them off as silly but harmless speculations by untrained thinkers, but these strange theories actually perpetuate racism and the denial of Native American legacies. It is important to approach the study of rock art from its legitimate historical and cultural context. Support for the Arkansas Rock Art project is provided by several organizations. The Arkansas Archeological Survey provides ongoing support for this project as an activity of the UAF research station. Support for setting up the current project was provided by a grant from the Arkansas Humanities Council in 1999-2000. A major three-year grant was provided from 2003-2006 by the National Endowment for the Humanities. This project would not be possible without the generous support of these organizations. Quick Fact sheets about Arkansas rock art that can be printed out for use in classrooms or for other educational purposes. A set of Short Pieces about special topics of general interest. A series of Articles that discuss in more detail general topics concerning Arkansas rock art and its relationship to other aspects of Arkansas and regional archeology. A series of Technical Papers that discuss specific topics involving the study and interpretation of rock art. A Resources section that includes a glossary, bibliography, activities and lesson plans, Rock Art Site Supplement forms that archeologists can download and print out for recording information about new or revisited rock art sites, and links to other useful Web sites. An online Database that can be searched for images and information on Arkansas rock art. A Just For Kids page with stories and activities that will appeal to youngsters. A series of Picture Galleries that provide images of interesting examples of Arkansas rock art. These materials enable visitors to explore basic research questions and learn more about this fascinating cultural resource.